Techniques for Swapping Words Using the StringSplit AutoHotkey Command; ErrorLevel for Producing Alternative Results; a Glance at a Regular Expression (RegEx) for Swapping Words. 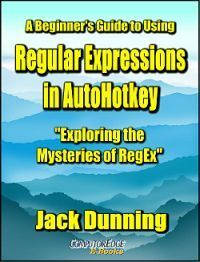 While Not For Beginning AutoHotkey Script Writers, This Regular Expression (RegEx) Trick Executes Multiple Complex Text Replacements without Even Writing an AutoHotkey Script. The GooglePhraseFix AutoHotkey Script Corrects Many Common Spelling and Grammar Errors While Demonstrating How to Download Information from the Web…Without Opening a Browser. The Trouble with Scripts Which Use Web Page Information, Plus AutoHotkey Tools for Downloading Web Page Source Code. The RegExReplace() Function Makes It Easy to Extract and Cleanup Text, Plus a Quick-and-Dirty RegEx to Strip All HTML Tags. The Wrong Capitalization of Letters in URLs Can Cause Page Access Failure—A Trick for Using an INI File to Solve Case Problems in AutoHotkey.